Nobody wants hard times. But amazing voices, music and songs can grow in the heavy soil of adversity. 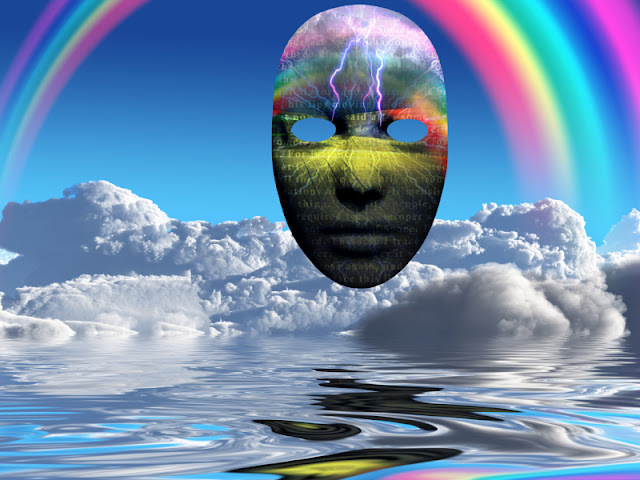 Where would the blues be, the classical lament, the bluegrass wisdom story, the dark pop ballad, the rock rage song without life storms and pain? The trick is to learn to use the storm like eagles do... ride the winds to higher sky. This Thanksgiving, my voice is grateful for it all. I was raised in a family that always made music. My dad, an air traffic controller, had been a singer and musician since his childhood; my alto voiced mother was raised by a musician, too, and both thought it only right to pass their skills on to their prodigy. As firstborn of my siblings, I got to sing the melody lead in our family band... until my sister Pam got old enough to sing. My father taught me to sing a part so she could sing melody! (How unfair!!) Then when the next sister, Beki, was old enough to join the family hootenanny, Pam got taught my part and I had to learn a different one! By the time our brother Bill came along, he got to sing whatever he landed on (but then, he was embarrassed throughout his childhood with the mandatory 'Little Blue Man' solo he was made to sing). But as for me... I always got parts duty. I sang melody only when there was a solo or unison section my father arranged for our amateur family band. OK so it was fun when I started lessons at 6, but after I found the joy of improvising and playing by ear, practicing for lessons was WORK! In fact, my piano teacher stopped demonstrating the song for me because she noticed I would memorized it by ear instead of reading the music. Yes, I was a brat. But my mother (aka 'She Who Must Be Obeyed") made me do it anyway, for years! Little did I know how I would use this abuse! I finally grew to love it so much I used to hole up in a college piano practice room for 5 and 6 hours at a time... for class and for the sheer joy of the sound and feel of my fingers touching the keys. The music theory I learned has come in handy on so many levels, including being able to get a job as a teenager playing for church and teaching beginner piano, getting a job as staff jingle singer which required reading music, later being able communicating intelligently with professional musicians as a producer. That theory I had to learn for piano lessons enabled me to create and write vocal charts on staff paper. Just recently I experienced the joy of playing piano in a little band at church on a Dixieland jazz version of Just a Closer Walk With Thee! To this day I depend on piano playing in teaching, performance, songwriting, arranging, vocal coaching, accompanying. Thank you so much for making me stick to those lessons - it's a gift that keeps on giving, dear Mother of mine! I was over the moon thrilled to land that choice staff singer position at the Tanner Corporation in Memphis in my early 20s. But singing from 8:30 am til 3:30 pm, 5 or 6 days a week, while simultaneously singing in nightclubs 3 to 5 evenings a week til the wee hours, and in between those jobs also singing background vocals in Memphis studios really tested my little pair of vocalis muscles. It meant my voice either got iron-chops strong AND learned to protect itself or my vocal control, health and career would come to an early demise. Janie Fricke was one of the girls with whom I did jingles, clubs and background vocals. Her voice was amazing... but right before she left Memphis to move to Nashville she was diagnosed with vocal hemorrhage. Her voice healed and she went on to a big career as internationally acclaimed country artist. Back in Memphis I was lucky... and somehow along the way I instinctively developed enough healthy vocal techniques to survive the abuse. I don't recommend that anyone challenge the voice like this because it IS dangerous, but I'm now grateful for every hard thing I put my voice through. It has helped me become a vocal coach who specializes in protecting the voice and conquering vocal strain. I wouldn't fully appreciate or understand what I was doing correctly til decades later, but remembering what had always worked for me in studio and on stage would light the spark that eventually become my vocal training method 'Power, Path and Performance'. Little did I know how incredibly important this life-shattering experience would turn out to be. As you may know, I didn't sustain permanent vocal damage. I had incredible doctors who did save my life. 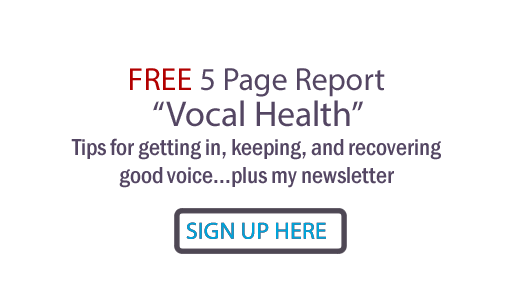 In the process of gaining my voice back, I learned the healing power of vocal exercise. I had taken one precious college year of classical voice and instinctively started carefully singing from the book '24 Italian Songs and Arias'. I noticed my voice beginning to feel better and gain some ground by working in my upper register. After moving to Nashville, I completed my recovery with Nashville's legendary Gerald Arthur, and alternative nutritional counseling with Liz Flannigan. I also developed an insatiable curiosity that continues to this day about anatomy, voice science and other alternative healing protocols including chiropractic, massage therapy, Feldenkrais and Alexander Technique. I love passing the healing on and witnessing the relief in the voices and faces of my vocal students. After I recovered from that illness, I continued jingle work in Nashville. It was awesome getting national residuals from AFTRA, and it was horrible watching that work fade, as companies began to advertise without sung ditties as part of their branding. It made me have to focus on my background vocal work, which led to meeting Tommy West, signing with MTM Records, winning an ACM award and having a hit career as recording and performing artist. In my experience, there's something worse than never having a record deal. It's having one and losing it. MTM Records folded when the parent entertainment company was sold to an entity that didn't want to have a record label. Overnight I went from famous to invisible - somebody to nobody. Because my jingle and background vocal career had been neglected, my professional voice was essentially silenced. Without a recording career, I began to focus on my songwriting. A few years later, I would co-write "One Way Ticket (Because I Can), which would go #1 and win a BMI Million-Air Award (signifying over 1 million radio plays). After writing for a couple of different publishing companies and not having enough significant songs cut, I was let go. Once again, I experienced career failure. I even had to take in the harsh criticism of my friend and songwriting mentor Dave Loggins, who accused me of writing like a spectator, not a participant. Once again, I was devastated. I had no idea how grateful I would be for another dead end. I had to brainstorm my next career move. About this time, my session singing and co-writing friend Carol Chase landed a singing position on tour with Lynyrd Skynyrd. She asked me to help her with a note she was having trouble with. Because I was able to help her (how did she know to ask me? ), I wondered if I might be useful as a vocal coach. I took on my first student and found I was intuitively able to diagnose the problem and help make it better. The rest is history... but I'm not sure vocal coaching, now the center of my work, would ever have crossed my mind if I had continued as a staff songwriter. I even began doing a lot of studio production and songwriting again with fresh participant fire. In addition to new songs and co-creating a couple of musicals, I wrote and released a new project with my husband in 2015 which I feel is the best music I ever made. So thank you, Dave... you pushed me because you believed I could rise to the challenge. Thank you, Carol... your friendship has been a life changer. Thank you God... for putting this tapestry of events - and people - together! Don't get me wrong. I could not have picked myself up and moved to the next era alone. I am truly grateful for every kind word of encouragement, praise and support sent my way. My spirit, like yours, breathes in positive reinforcement like lungs needing air. I'm also grateful for all the corrections and criticism that made me dig a little deeper. Thank you to my husband, son, family and friends who are part of my eternal village. Thanks to all supporters of the music I've made. And thanks to YOU, dear All Things Vocal reader/listener. To paraphrase Rascal Flatts: I'm grateful for every broken road that led me to be useful to you. It has taken me to the most fulfilling part of my journey yet. When you come upon a hard place in your journey (and everybody does), use my story to encourage you. Every time I thought I was facing a dead end, it was just a turning point, a redirection. None of it was wasted! I have experienced God as the Great Compost Maker. When I turned 'it' over, that which looked like crap became incredibly useful fertilizer. So my advice is: Trust your journey! Do your very best and whatever comes, embrace it all. Then use your stronger, wiser and more useful voice to benefit the world. Your vocal gratitude list, like mine, will be full of colorful surprises, twists and turns, dips and heights.... and storms that birth rainbows! I'd love to have your comments. Have you had hard times that fed your voice, your journey, in ways that now surprise you? Please share! I believe it was hard to go through at the time, but still a career most would envy. Thanks for sharing, Judy. Edward... glad you can relate; I love our vocal lessons and I know some of your voice's magic comes from the harder parts of your road. Meredith... thank you, I truly am grateful for everything, and for the friends I've made along the way such as other voice experts who share their work - like you!